"smallequestrian" began the thread as a repository of instrument finishes so one can get a better perspective of the colours. He may have plans for something in the future but, at this stage, that's all it is. Also remember that the thread is relatively new and still in its infancy. 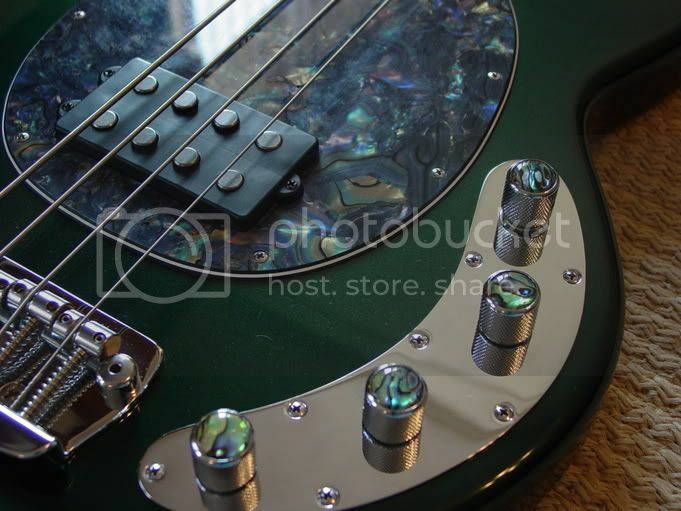 dammit, I due love Envy Green, I really wish I had one. I have some updates planned for this, but I have been having some work issues keeping me from updating. Here is my 2001 Sterling fretless, in Vintage Sunburst. I just noticed you're thin on trans red. I was actually looking at that last link and was wondering if it was actually Fire Engine Red or just a mislabled CAR. But upon closer inspection it definately looks "more orangish," for a lack of a better term, than CAR. I wonder when the stopped offering FER for CAR? There was recently one on eBay with a matching headstock. If you dont wanna dig around, so "go" and Ill find it. Are there any pics of this color? I tihnk its trans blue burst or something like that? I snagged those pics earlier and will add them at some point. I believe its just trans blue, but I am not sure. Idk it looks different to me, unles its just the magic of the lighting and grain of that one. Transl blue looks to be a different shade, but pictures are hard to tell sometimes. Last edited by Figjam; 02-23-2006 at 02:31 PM. Anyone on here have a metal flake brown Ray??? Honestly one of the best finishes i've ever seen.